Merle Klassen of Albion, a long time member of Manderson Lehr Post No. 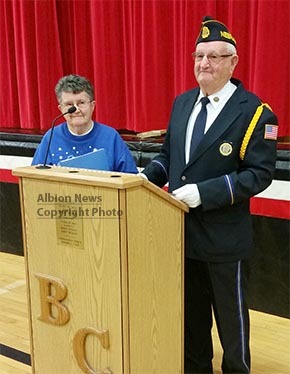 162, American Legion, received the Living Veteran award during the Veterans Day program at Boone Central High School on Wednesday, Nov. 11. This award is presented annually by the local American Legion and VFW Posts. The presentation was made this year by Merle’s sister, Florence Streeter. Merle was born at Albion Sept. 10, 1936, and attended country school at District 7 and District 72. 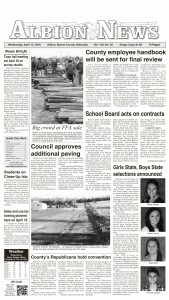 He graduated from Albion High School in 1953, and began working for the Boone County Roads Department. He was drafted into the Army and sent overseas to Germany, where he was stationed from 1960 to 1961. After being discharged from the military, he went back to work for the county road department, where he worked for a total of 48 years. He was married on Oct. 29, 1972, at St. Michael’s Church. He has two children and four grandchildren. After retirement, he started working various jobs, and is now employed by Country Partners. His hobbies are gardening, puzzles and very good cooking for the Knights of Columbus, Boone County American Legion and American Legion baseball. Merle is a member of St. Michael’s Church, Knights of Columbus, Advisory Board of the Senior Center, and is a very dedicated member of the American Legion Honor Guard and Color Guard.